In The Right to Stay Home, journalist David Bacon tells the story of the growing resistance of Mexican communities. Bacon shows how immigrant communities are fighting back envisioning a world in which migration isn’t forced by poverty or environmental destruction and people are guaranteed the “right to stay home.” This richly detailed and comprehensive portrait of immigration reveals how the interconnected web of labor, migration, and the global economy unites farmers, migrant workers, and union organizers across borders. “Bacon’s work reminds us that migration has a profound impact on the places migrants leave from, just as surely as it does on the places they go to. He argues persuasively that the right not to migrate cannot be divorced from immigrant rights.… The heart of David Bacon’s whole body of work is in human stories, and this book validates its ideas with vivid testimony, in their own words, from those most affected.” —John W. Wilhelm, president of UNITEHERE! 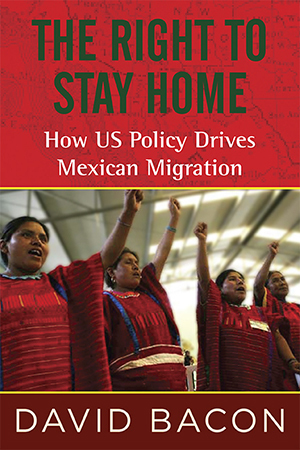 "An important contribution to the current immigration debate." When I left the organizing staff of the United Farm Workers in the late 1970s, I took with me some functional working-class Spanish and a new worldview. I grew up in Oakland, California, and knew nothing about Mexican culture before I left the Bay Area to work in rural California and Arizona. In the union I began to learn--the UFW was a great teacher, and I’ll always be grateful to the workers and organizers I met there for changing my life. I was a pretty good organizer in a union that had some of the best. I helped workers pull together their committees and picket lines, and fight the foremen and the growers. I have good instincts and grew up in a left-wing family, so in many ways my own culture fit pretty well. And I really loved the union’s culture. Holding hands and singing in union meetings! Eating lunch and talking in the grape rows or under the tangerine trees. No sleep. Here’s how the day went during just one campaign in Calexico and the Imperial Valley. We’d have meetings of worker/organizers til midnight, then meetings with the campaign leaders til one, then get up at three to get down to the Hoyo when workers were crossing the border, then drive in the dark up to Blythe, then talk for hours next to the field with workers waiting for the ice to melt on the lettuce, then house visits after work in Mexicali, and then the meetings in the evening all over again. You get the idea. Exhausting. Inspiring. You learn a whole world in a short time. The other thing I took with me leaving union staff, or rather didn’t take with me, was money. I had to get a job quickly, to pay child support and just to live. So I went to Salinas to get a job picking strawberries. I couldn’t last a week bending over that far, and my hands were far too slow. So I went over to Hollister to get a dispatch at the union hall to work the wine grape harvest at Almaden, then one of the world’s largest wineries. A thousand workers showed up the morning the picking started. I was the only white guy. Most knew each other from previous harvests, so they quickly formed crews and went to work. A few dozen were left, and from them each tractor driver picked the six who would pick behind his gondola. Finally there were just six left. It was like not getting picked for softball in junior high. Our crew, the final six, made up the slowest pickers in Paicines, Almaden’s long valley of grapevines south of Hollister. So with typical Mexican irony, we called ourselves Los Relampagos--the Lightning Bolts. We never made much more on the piece rate bonus than the hourly guarantee, and my crewmates were pretty impatient with me. Each crew of six splits credit for what they all pick, so the faster pickers basically carry the slower ones. Almaden and the Hollister UFW office were self-administered by the workers’ elected ranch committee. That was a tradition in the wine grapes and was also true of the union at companies like Christian Brothers and Paul Masson. In all these companies, workers themselves did most of the original organizing, helped by Jose Luna, a legendary worker/organizer who expected them to carry most of the load in running the union. I earned my credit with my crewmates when the company decided to bust the number-one tractor driver on the Almaden seniority list, accusing him of sleeping on the job. By sending him back into the picking crews, he would have lost not only his place in the list but a good year-round job driving a tractor. His family would have been thrown out of their company-owned house. I suggested that we hold a company-wide meeting in front of the office in Paicines at lunchtime and then refuse to go back to work until the company talked with us. Farmworkers organize work stoppages a lot, so the idea wasn’t that strange. The company did agree to talk with us. We called in Bill Granfield from the Salinas UFW office, knowing that the managers needed to save face by seeming to agree with the union’s official representative rather than with us, the workers. Bill, a good organizer, knew the game too and played his part well. Our driver got his job back, and after that my crew might not have been fast, but we were well loved, me included. Human Beings or Just Workers?